The Incredible Bionic Man crossed the Atlantic in two trunks just to walk around the New York Comic Con. Then he'll star in a Smithsonian Channel video, airing October 20. 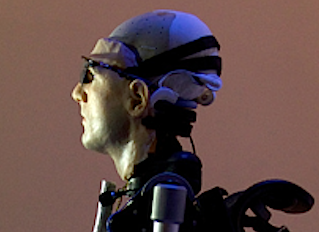 Created by the Shadow Robot Co., Bionic Man breathes and walks. He was assembled from the best prosthetic body parts and robotic technology available. His face is modeled after Bertolt Meyer, a 36-year-old social psychologist at the University of Zurich who was born without his lower left arm and wears a bionic prosthesis. the robot has about 60 to 70 percent of the function of a human. It stands six-and-a-half feet tall and can step, sit and stand with the help of a Rex walking machine that's used by people who've lost the ability to walk due to a spinal injury. It also has a functioning heart that, using an electronic pump, beats and circulates artificial blood, which carries oxygen just like human blood. An artificial, implantable kidney, meanwhile, replaces the function of a modern-day dialysis unit.